Archer aimed with his customized compound bow. For many of my fellow outdoor adventurers, the leaves changing color going into autumn can only mean one thing: it’s time to start getting ready for the local bow hunting season. For other people the beauty of archery is its own reward and every day you can make it outside is a great day to polish off the bow and get some target shooting again. I mean let’s face it – the two are not mutually exclusive. If you’ve read this far it’s a safe bet you’re pretty enthusiastic about bow hunting. 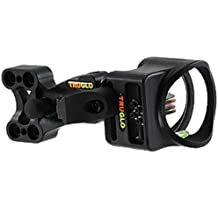 This means making sure absolutely everything is set to go by opening day – including focusing in or upgrading your current compound bow sights. Some people like fewer pins while others like more pins – but best to understand what your preference is before that moment you need a perfect shot. Read on to learn more about the best compound bow sights on the market. 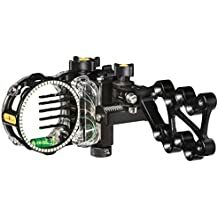 So What Are the Best Bow Sights? Obviously everyone has their preferences. While many deer bow hunters prefer five pins, there are a few really successful old timers I know who still swear by the three pin. As with anything, so much comes down to practice and comfort. Yes, I know a bolt action single shot rifle with open sights isn’t going to compare to a scope…but you’d be amazed what I could do with one because I’ve been firing almost exclusively open sights since I was eight. So while these are general ratings, consider what you’re used to. Trying new style of sights is never a bad idea to see what you really like. Note on the chart: Many of these we choose the model that we like best. That means we may review a model with 3 pins but that brand/style also has 5 & 7 pin designs. The true is the same of the others, so adjust as needed. No one familiar with good compound bows will be surprised to see the Trophy Ridge name appear on this list. The Trophy Ridge React Pro Sight just might be the best top rated compound bow sights on the market. What sets Trophy Ridge apart? This compound bow sights comes with React Technology, giving a high end mathematical precision to every shot. Designed with automatic adjustment, the pins should adjust to create for you the perfect location before your next shot. Correcting your sight is easy to do and the apparatus is built in to work with elevation adjustments. So even on uneven ground or sudden terrain shifts you can help target in for that perfect shot. The Third Axis Adjustment is specially made in a way that will allow you to view targets accurately in long distances, around hard angles, and in all kinds of real world situations that you are likely to run into during deer hunting season. The hardware of the actual bow sight combines stainless steel that is complimented by a solid aluminum construction for guaranteed durability. This is a hunting sight that is built to last! Users appreciate this compound bow sight since it is ultra-bright. It has a 0.019″ pin and medium fiber optic yardage indicators so you can rely on it even in bad weather conditions. That is a definite plus! The bow sight features a right hand style that may be a limitation for the bow hunting enthusiasts who are left-handed. However, for the majority of hunters these sights are going to take things to the next level. With Trophy Ridge React Pro Sight, you are sure to shoot your arrow right where you need it. This bow sight features 5 ultra-bright 0.019″ medium horizontal fiber optic pins. These provide utmost visibility for accuracy while shooting. You can readily customize this bow sight since it comes with offset mounting holes, giving that level of versatility and control that most hunters want. 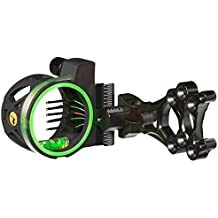 Being one of the best compound bow sights in the market, it has a precision installed bubble level so you are able to align the shots perfectly before loosing the arrow. 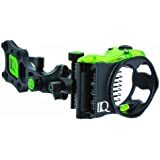 The green accent makes it easy to line up the target perfectly with the pins and line up or readjust your shots based on weather conditions. 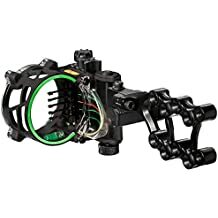 This is also going to take the spot for Southpaw hunters since this particular model of bow sight is highly versatile thanks to the reversible mount design that allows you to use it whether you are left-handed or right-handed and allows this to work with bows designed for either. The sight is compact, featuring simple dimensions, and making it easy to carry, add or remove from the bow, or store. 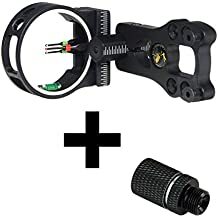 This compound bow sight has an adjustable indicator pin. Furthermore, the pin settings are unlimited so you can arrive at the sight you are looking for. The pins have silent adjustments so your focus remains on the target as you attempt to get the desired view. Constructed from aluminum, which not only makes it lightweight but also durable. The retina lock technology featured in this brand makes it one of the best hunting bow sights in the market. This is because it gives you better muscle control and really helps you train yourself to create muscle memory for aiming with each pin. For many hunters this means better long distance shooting over time that is only going to continue to improve the more you use it. Using the adjustable knobs and displays it becomes really obvious that in-field adjustment becomes no problem at all and a little bit of change can go a long way. In other words, the micro adjust knobs that you can adjust quickly and easily to get the correct elevation as well as windage. The adjustment markings will help you to identify the accurate positions. You can then lock the attained windage and elevation using the tool free locking knobs. This bow hunting sight features 3, 5, or 7 fiber optic pins that are stack tight and a built-in sight level. Moreover, this compound bow sight has a dual position mount so you can view with the desired shooting style. Weighing only 7.4 ounces, you have to like the lightweight nature of this sight and how it doesn’t add serious weight to your bow. Finally, it’s worth pointing out that this sight has an adjustable second axis due to the rheostat sight light accessory S15000 that you have to buy separately. This bow sight is constructed from 6061-T6 aluminum that renders it sturdy and light for ease of handling. Easy to fit and place on the bow, there’s a lot to like about this simple but reliable bow sight. The 3 fiber optic pins are 0.029 inches in diameter and are made from brass, which is not only strong but also durable. The Topoint Archery Bow Sight features red and green colors. A good feature for most, although for those of us who are color blind, that can be a bit of an issue. The level comes with two vertical bars and has undergone thorough use and shaking tests and passed. This guarantees its performance and reliability while bow hunting. What we love most about this bow sight is that it is readily adjustable for use by either a left-handed or right-handed shooter. This is the main factor that propelled it to our list of top rated compound bow sights. This sight features markings for both elevation and windage. These are adjusted quietly, allowing your concentration to remain on finding the right positioning. This bow sight weighs about 5.6 ounces for portability. The Trophy Ridge Fix Series Sight is designed with dependable precision due to the presence of micro-adjustable pins. This company understands how important it is to give hunters a clear sight line and that is why it provides you with the ultimate visibility since it comes with ultra-bright 0.019 horizontal fiber optic pins. These pins are easy to adjust and will effectively achieve the desired view. They have heightened accuracy even as you view targets in longer distances using the reliable second-axis adjustment. If you want a brighter or darker view, you can adjust the brightness of the pins with the rheostat light. This will allow you to attain the brightness that suits all shooting condition. Furthermore, the pin adjustment tool is stored on sight so you can quickly use it. When it comes to actual dimensions these sights weigh approximately 5.1 oz and measures about 11 x 5 x 4 inches. This bow sight has an AP pink camo so your target does not spot you as you hunt. It is constructed from carbon composite, which is exceptionally light. It has a Tru-Touch technical coating that is soft to the feel so you can comfortably use it. It features a micro push-button light so you can put it on easily when need be. It is also designed with Tru-Flo fiber for durability. This is complemented by the fact that the fibers are extra-long and fully protected. What’s more, it is made with a large circular field of view that is enhanced by the aperture that has an inner diameter of 1.8. There is a level that has 2 vertical bars. To get a greater vertical adjustability, the bow sight comes with a reversible bracket. In addition to this, there is a shooter’s ring that glows in the dark for better visibility. Being among the top rated compound bow sights, it is readily adjustable for use by right and left-handed shooters. This bow sight measures 8.8 x 7.8 x 3.2 inches weighs 6.4 oz, falling in general line with many of the other sights that make this list. First shot was a bit off but the others come in nicely after an aim adjustment! There’s no question that compound bow hunting is extremely popular, and it isn’t hard to see why. The skill, the excitement, the meditative quality when you have to focus in on the moment. Focus on moving slowly and silently. Focus on getting that perfect aim. Being able to focus in for that perfect shot that puts some venison on the table for winter. Then there are just the amazing benefits of being truly immersed in the environment. The ability to focus on a tangible skilled task at hand isn’t appreciated nearly enough. So how does a good compound hunting bow sight make a difference here? Having a reliable sight allows you to make more accurate shots from longer distances. You don’t need to be an expert hunter to see why this is going to be a big help. However finding a great bow sight is easier said than done. However if you stick to the sights on this list and consider the following four factors, you’ll be likely to find the right fit for your bow hunting needs. The materials used can tell you a lot about the overall quality. Are the metal parts machined? Are they made from special carbon steel or aluminum that stand out as being above and beyond more conventional building materials? Take a look at design and see what the dimensions tell you. You want to make sure that only top notch materials are used and if a hunting bow sight refuses to mention the materials used to build it, that could be a red flag. Also always check the length of warranty. A warranty that is unusually short or unusually long can both tell you a lot about how the company stands behind their work. This is another good sign, especially when it comes to the world of hunting gear where you’re dealing with a group of well-educated and opinionated consumers who can tell good from middlin’ from poor & cheap. While this won’t always be a guarantee, generally speaking the better known the company and the longer the history they have of creating truly high quality outdoor products, the better the chances the bow hunting sight you’re buying will hold up. Reputation is earned (and lost) for a reason. While this definitely isn’t the end all, be all, in and of itself it is something that needs to be kept in mind when closing in on a decision. This gets covered in multiple places but few things trump experience. Whatever type of compound bow sight for hunting you choose, make sure you have time to train with it. Some hunters vastly prefer a one pin sight while others love the 3, 5, or even 7 pin option. There isn’t necessarily a right or wrong answer on this one but whatever you shoot the most with you’ll likely be he best with. In other words, a little bit of practice can be a long way. In the ideal situation you would be able to shoot at a range for some amount of time with all of them – including at uneven distances to learn how to adjust for those “in-between” distances which can be a problem if you’re not familiar with how to adapt the multi-pin bows. Get some range practice in with different types of sights. This isn’t only good advice if you’re working with something new but it will also help you to check out other options and see if there might be an even better one out there than the one you’re currently used to. There are plenty of options available on certain bows when it comes to customization while others are really limited. However, the ability to add sights, to adjust them, or to move them right or left depending on how you shoot are all options you’ll want to look at. While this is generally a bit lower on the list than the other factors to look into, but it still is one that you want to consider. After all, this could be the tie breaker between two very closely rated bow sights when you like them both about the same. So while the main focus of this article is compound bow sights that feature 3, 5, or 7 pins, the fact is that there are a lot of different options out there. The best equipment for a hunter is the equipment that makes him or her more likely to make that shot. The first thing to think about it is how familiar you are with a certain pin type. If you’ve never used anything other than a single pin or seven pin, it can be hard to adjust to something else, at least at first. Do you have time to practice and get used to a new sight or are you right at the point where you need to head out and do some hunting? That all matters. The more familiar you are with a certain sight, the better you’re going to be using it. Why stay with single pin bow sights? While many of the bow hunters I know go with multi-pin sights there are a few who do prefer the single pin systems. While some hunters don’t like these because of worry that a deer may spot your movement while adjusting the pin to help guide your aim, others find the simplicity and reliability to be strong points that definitely outweigh any drawbacks. On the other side, the multi-pin sights have a degree of versatility that is hard to argue with and has won many admirers in recent years. It’s hard to argue with the ability to adjust the aim without having to move. This is an older discussion but it gives some personal points of view worth looking at here at this bow hunting forum, and if that isn’t quite enough for you here’s another good forum conversation about the 3 pin versus the 5 pin. We hope that this article will come in handy as you shop for the best compound bow sights. Be sure to consider the diameter of the pins, adjustable brightness, field of view, construction material, and features that the vertical levels have to offer. There are several different things you need to consider when looking at which sights are going to be best to meet your specific needs but if you do, you’ll be amazed at the results that can follow.